The TBOX 2016 pub crawl is this Saturday, December 10th, from 8:00 a.m. to 8:00 p.m. Around 40 of the establishments along Clark Street and Sheffield Avenue will be participating. There will be no parking on Clark from Roscoe to Grace, on Sheffield from Roscoe to Waveland, on Eddy from Seminary to Clark, and on Cornelia from Clark to the alley from 5:00 a.m. Saturday to 4:00 a.m. on Sunday. TBOX will provide a hotline to be used during the event for any and all issues, concerns, or questions: 773-478-3378. 9-1-1 should be used for all emergency calls. The 19th District will have additional resources and there will be 100 trained security personnel patrolling the streets and alleys during and after the event. Members of the security team will be identifiable by yellow vests that read “Walsh Security.” There will be zero tolerance for public drinking and security personnel will remove TBOX wristbands of unruly patrons. Barricades will be placed to deter patrons from entering alleys and keep them out of the streets. 80 trashcans, 60 portable toilets, one dumpster and 12 cleaning personnel will be stationed throughout the event area. This entry was posted in Community News and tagged festivals, Parking on December 9, 2016 by elvn_updates. Tonight, the Chicago Cubs host the Cleveland Indians for game three of the World Series at 7:08 p.m. This will be the first World Series game played at Wrigley Field in over 70 years. This historic event brings a level of excitement and anxiety Lakeview has not seen in decades. As such, residents, businesses and visitors should anticipate heightened security around the ballpark. Arterial streets between Belmont and Irving Park, and between Halsted and Southport will likely be closed to vehicular traffic at the discretion of the Chicago Police and OEMC during these home games and clinch games. Residents close to Wrigley Field should keep photo IDs and proof of residence if not on ID available for presentation to either CPD or Traffic Management Personnel. I know the complications and stress these restrictions have, and I thank you for your patience and cooperation during this time. All home and away games start at approximately 7 p.m.
Beginning at noon on Friday, October 28th through Monday, October 31st at 4 a.m.
*Parking restrictions have been established by the Chicago Police Department to ensure emergency access, staging of support vehicles, pedestrian and vehicular safety and crowd control. 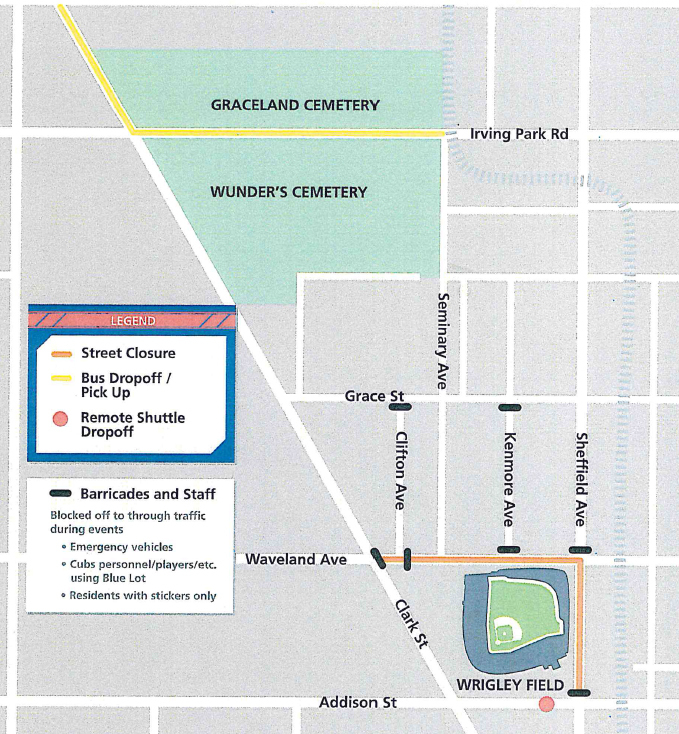 Parking restrictions and street closures will be implemented throughout the World Series. Please look for posted paper signs prior to parking. **Racine will be used as the Clark Street alternate CTA Bus Route. ***Please note that truck traffic will be prohibited within one block of Wrigley Field on game days. Clark (Irving Park to Belmont) Full street closure expected to be in effect on game days as deemed necessary. Addison (Halsted to Racine) Full street closure expected to be in effect on game days as deemed necessary. Friday, October 28th – 7:08 p.m.
Saturday, October 29th – 7:08 p.m. Residential Permit Parking will be in effect and will be strictly enforced beginning at 5 p.m. Vehicles parked in violation of the permit parking regulations are subject to ticket and tow. Cubs Night Game Tow Zone is in effect 5 p.m. – 10 p.m.
ALL night game parking restrictions will be in place (i.e. north side of Addison from Clark to Ashland, north side of Eddy from Racine to the alley, etc.) This is in addition to any other parking restrictions implemented as listed above. The area between Racine and Halsted, and Irving Park and Belmont is expected to have large crowds. Vehicular and pedestrian traffic will likely be restricted. Residents are encouraged to carry current identification and/or a current lease or utility bill for access. Vehicles parked in violation of parking regulations resulting in a public hazard, such as bus stops, no parking/ tow zones, crosswalks, driveways, alleys, etc. will be strictly enforced and are subject to ticket & tow. The Cubs Hotline is open one hour before until two hours after all home games. Residents are encouraged to contact the Night Game Hotline, 1-866-427-3869, for towing and other quality of life issues. Residents should call 911 to report all emergencies. “Hospitality Teams,” an independent third party hired by the Chicago Cubs, will be present throughout the neighborhood. The teams provide a visible presence in the community and provide post-game crowd observation and incident response. For additional information, click here, or view the update Office of Emergency Management and Communication release here. This entry was posted in Community News and tagged Chicago Cubs, Parking, traffic, Wrigley Field on October 28, 2016 by elvn_updates. Beginning at Noon on Tuesday, October 25th through Thursday, October 27th at 4 a.m.
*Parking restrictions have been established by the Chicago Police Department to ensure emergency access, staging of support vehicles, pedestrian and vehicular safety and crowd control. Parking restrictions and street closures will be implemented throughout the NLCS Series. Please look for posted paper signs prior to parking. Sunday, October 30th – if necessary – 7:08 p.m. This entry was posted in Community News and tagged Chicago Cubs, Parking, Wrigley Field on October 25, 2016 by elvn_updates. Beginning at Noon on Saturday, October 22nd through Monday, October 24th at 4 a.m.
Beginning Saturday, October 15th at 8 a.m. through Monday, October 24th at 8 a.m.
Saturday, October 22 – 7:08 p.m.
Sunday, October 23 – if necessary – 7:08 p.m. Please carefully check for either permanent or paper posted signs when parking your vehicle. Vehicles parking in violation of parking regulations, public hazards, bus stops, no parking/ tow zones, crosswalks, driveways, alleys, etc. are subject to ticket and tow. This entry was posted in Community News and tagged Cubs, Parking, Wrigley Field on October 21, 2016 by elvn_updates. Wrigley Field is hosting two concerts at the ballpark this week. Billy Joel returns to Wrigley Thursday, August 27! The show begins at 8:00 pm. Foo Fighters will make their first appearance at the ballpark on Saturday, August 29 at 5:30 pm. Gates open two hours before the show begins. You can find information on street closures, parking restrictions and what to expect the day of the concerts below. Parking is available at the remote lot, located at 3900 N. Rockwell, with a free shuttle to the concerts. Lots open at three hours prior to each event. Starting after the game on August 24th – Street will re-open on Monday August 31st. Trucks, Crane(s), Forklift(s), etc. will beginning lining up on Waveland at approximately 5pm (8/24) and proceed to Sheffield where they will be unloaded and move materials into the Ballpark. The Lights at Wrigley Field will be on throughout the week as the Concert Setup/Takedown takes place. Lights will be on overnight on August 24th into August 25th.Lights will be on to at least 11pm on August 25th, August 26th, August 28th and August 30th.On the show days of August 27th and August 29th, the lights will be on OVERNIGHT. Trucks, Crane(s), Forklift(s), etc. 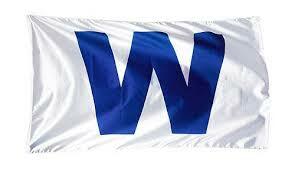 will begin lining up on Waveland Saturday night, August 29th, to unload materials from the ballpark. Trucks will be traveling from the Green Lot at Grace and Racine to the ballpark during both setup and takedown. All work should be complete Monday August 31st. Sound and Lighting Checks are anticipated on Wednesday August 26th and Friday, August 28th and will be completed by 10pm. Sound checks should also be anticipated on the day of each concert. Gates Open at 3:30 pm and Show begins at 5:30 pm. The Cubs Hotline will be open One Hour before until Two Hours after the concerts (1-866-427-3869). TAILGAITING AND ALCOHOL CONSUMPTION ON THE PUBLIC WAY ARE PROHIBITED AND WILL BE STRICTLY ENFORCED. This entry was posted in Community News and tagged Parking, Wrigley Field on August 26, 2015 by elvn_updates. Full event details for Pride Fest can be found on the Northalsted Business Alliance website. Halsted Street will be closed between Broadway and Addison from Saturday 12:01 AM until Monday morning at 4 AM. Bradley Place from Halsted west to 840 W. will be closed the same hours as Halsted. ALL VEHICLES LEFT ON THE STREET WILL BE TICKETED AND TOWED AT YOUR OWN EXPENSE! We hope our East Lake View Community participates in and enjoys the event! This entry was posted in Community News and tagged Cubs, festivals, Parking on June 20, 2014 by elvn_updates. The 2013 Annual Halloween Parade will be held on Thursday, October 31st along Halsted Street from Belmont to Addison. Registration will be at 6:30pm at the staging area at Halsted and Belmont. ALL VEHICLES LEFT ON THESE STREETS WILL BE TICKETED AND TOWED! Halsted from Belmont to Addison will be closed to traffic from 4pm to midnight. Melrose, Aldine, Buckingham, Roscoe, Newport, Cornelia, and Brompton, east and west from Halsted to each alley, will be closed to traffic from 4pm to 11pm. If you have any questions regarding street re-routes, please call the 44th Ward Office at 773.525.6034. This year’s Northalsted Halloween Parade Theme is Twisted Circus! Join your friends and neighbors for the best Halloween celebration in Chicago! Come dressed as clowns, sword swallowers, bearded ladies, and ringmasters celebrating the Twisted Circus theme of any costume creation you choose! Participation waivers are required for individuals marking in the parade. Participation waivers can be found here. Prefer to watch instead of march? Enjoy the fun from the street beginning at 8pm. This entry was posted in Community News and tagged festivals, parades, Parking on October 30, 2013 by elvn_updates.